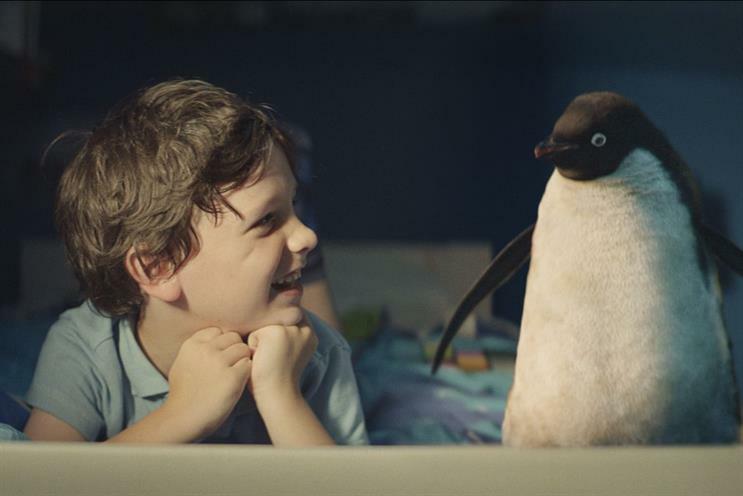 John Lewis' 2014 Christmas ad is more compelling than the retailer's 2013 effort, according to research from Ipsos Mori. The researcher worked with RealEyes to use facial coding techniques to measure the reactions of 300 UK adults as they watched the John Lewis ad "Monty the Penguin", which was created by Adam & Eve/DDB. Ipsos then compared the results with data collected last year for John Lewis’s "bear and the hare" ad, also by Adam & Eve/DDB. According to the results, this year’s ad was much better at keeping people engaged. Jon Harper, the head of advertising and brand research at Ipsos Mori, said: "John Lewis has struck gold with this year’s Christmas ad, gleaning an emotional response that comfortably out-performs last year’s effort. 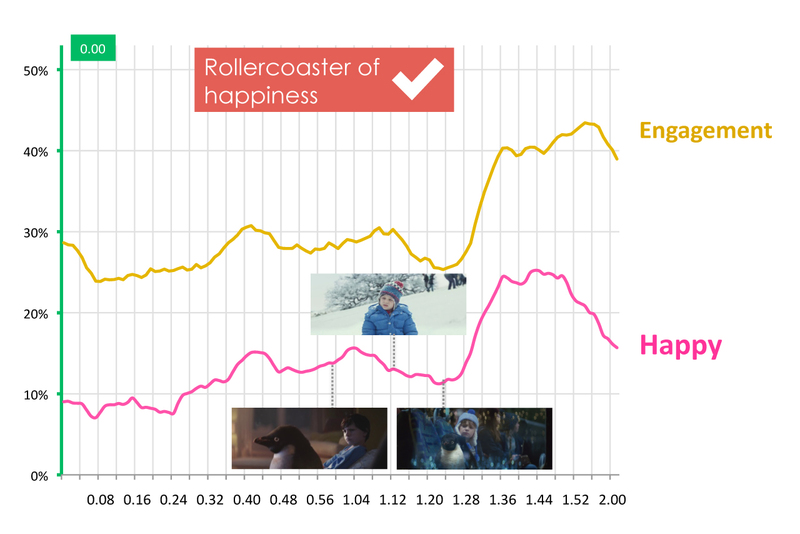 "Using neuroscience techniques we have tracked viewers' emotional journey while they watch the ad and we found Monty the Penguin holds people’s attention throughout, eliciting a range of emotions with an all-important sustained peak of happiness at the ads conclusion." 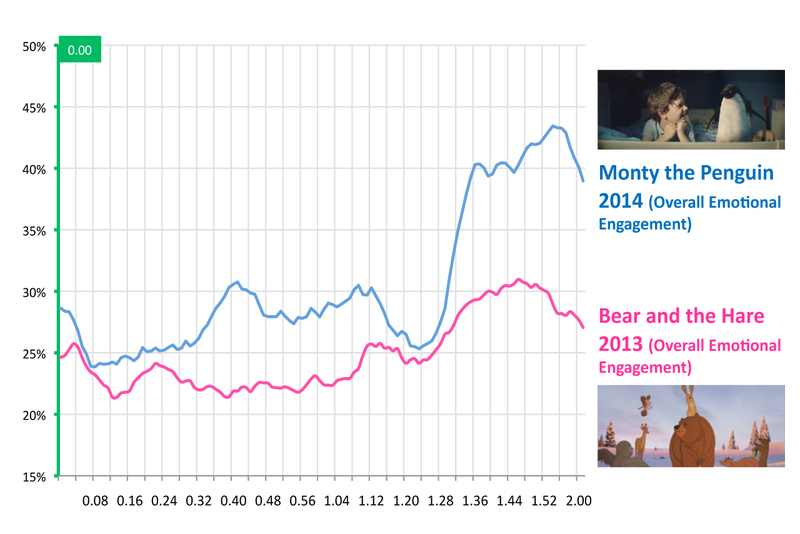 On overall emotional engagement "Monty the penguin" is within the top 20 per cent of the database (vs. last year’s "bear and the hare" only falling within the mid 20 per cent). There is a strong hook at the start, with a nostalgic hit of Pingu initially and the early revelation of another penguin on the scene (Monty) piquing interest. The "slice of life" scenes are fun with some standout moments (fish finger and lake-swimming scenes), which add to the quirky comedy of the overall scenario. Monty’s sadness gives an emotional heart to the ad and provides empathy, and this helps to take the viewer on a more rounded journey (see picture below), which leads to a very strong pay-off at the end. The final pay-off scene is multi-layered. The pay-off for Monty gives the initial emotional tug on the heart-strings, but it is then topped by the realisation that it is all in the child’s head and that Christmas is really all about imagination and wonder. The music is less dominant than it has been in other John Lewis ads. It’s not the driving force but instead a more understated back note to the action unfolding on screen, and it is the more powerful for it. Tom Odell is arguably less well known than some of the previous voices lent (Ellie Golding and Lily Allen), but the music does really give am emotional kick to both those more melancholy moments but also the revelation at the end.